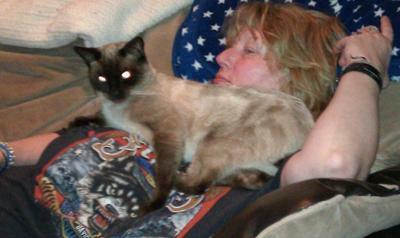 My male Siamese came from a lady who had thirty cats or more. Very bad. But, my little man Nero came from there. He has these Bengal-type marble stripes on both sides of his body. I never saw this before. Could be his parents were mixed? A gene that skipped a generation? My kitten named Delilah has the same markings. We got her when she was six weeks old, and her family is all tabby and "mutt" kittens. The previous owner said that when she was first born, her Siamese markings were very faint,but after 2-3 weeks, they started to get more vibrant. After the couple of weeks that we brought her to her new home (my house) we started to notice that she was gaining faint, tan colored stripes on her back, legs, and face. We don't know if she is a special kitten, or if all Siamese have these markings. Hi. I got my little kitten, his name is Tarzan. We got him when he was four weeks old, he's about nine weeks now, the lady who gave him to me told me he was a Bengal mix Siamese, but from the posting I saw above about the Tonkinese, I am not sure if my Tarzan is Bengal mix? From your description, it does sound as if Tarzan (what a great name by the way!) could easily be a Bengal/Siamese mix. Why not send us a photo of him, or pop in to our Facebook page and post his picture there so we can take a look (and admire) him? Hi. I have a blue point Balinese and she has two racing stripes down her spine with two matching circles on her sides, but hers are tone on tone. She is eleven weeks old and her markings are getting more pronounced everyday - we who have these cats are very lucky, they are unique and very smart ... no two are alike! Hello, about a month ago I got a kitten, she's got the Siamese marking but all of a sudden she has these stripes up and down both hips, what could that be? She's beautiful. Note from Caroline (Admin): Abbie, your kitten sounds as if she might be a lynx point Siamese. Does she look anything like the cat in the picture on this page? I have a 7-month-old kitten who shares the exact same markings. He's a seal point Siamese with faint stripes and spots all over his little body. His litter mate looked like a Bengal. Karen, thanks for your photo and story about Nero. I must admit I've never seen a cat like Nero - but I'm sure you're right, his parents (or grandparents) were probably mixed. He's certainly got some Siamese in him - as for the rest, it could be Bengal, or tabby, or something else entirely! It's always difficult to tell when you don't know who the parents were, but he's a lovely boy and I think he's very lucky to have found you!